Into the green we go, entranced by these twelve new pieces from Tor Lundvall. ‘The Park’ revels in open fields of grass or on the trails through the woods over the hidden beauty to be found in silence and reflection. Some would say that this is what he always does but I disagree and that’s to do with the subject matter he’s covering on this album: this place may seem peaceful on the surface but if you stay long enough and let your eyes adjust to your surroundings, nothing is what it seems. Those trees which appear docile and motionless have personalities and individual traits to them which are hidden in an expert fashion. This record is all about escape. Escaping from your problems, escaping from the world outside; to hide in plain sight and manage not to be noticed is an almost unheard-of skill yet here it becomes possible. I used to live down the street from a place like this when I was young and it was there, and only there, that I began to understand how insignificant my “problems” were. 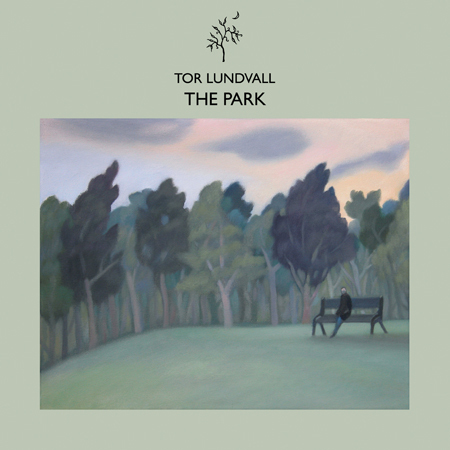 When most people go to the park, they plan it out and have some kind of event up their sleeve but Lundvall’s newest is for the type who has no reason to be there and for whom time is a concept, not a measurement. Playing this releases you from everything; you have no cares any longer, while listening the static of life is banished. I’ve noticed that people start to become uneasy when the sun sets in a park, for me it is the most interesting time to be in one; as the light fades a whole new side to it comes out. Parks are places of mystery, what is postcard perfect when the picnic crowd tromp around is actually just putting on a show of it’s own. Go on and walk into the depths in twilight, try to tell yourself you don’t feel swallowed up. Sounds carry from one end of the place to another and even though you’re nowhere near a single soul, there’s a sense that it could be coming from anywhere… even two feet away. This is an immersive arena, one not meant for the eager ears but for the ones who can be still. That’s it, sit down on the bench. Life surrounds one, it only takes an LP like this to make you realize it. I can smell the leaves. Somehow he has imparted every single facet of where he wanders onto wax but I think we all know he’s not doing any of this aimlessly, he never does. There’s something going on here and yet on the face of things nothing is: we’re just going for a stroll along with Tor in his favorite park. If it were that simple then none of us would own as much of him as we do. It is as though he’s taken the approach used on his earliest recordings (some of which wound up on the album ‘Insect Wings, Leaf Matter & Broken Twigs’) and figured out how to fuse what he writes inside to what he captures in the outdoors. Owners of the ‘Field Trip’ cassette are going to play ‘The Park’ into the ground. Further development has taken place in Tor’s sound, but you must listen carefully to hear it. I think I’ve even managed to work out what the symbols on the sleeve art are up to: subtract twelve from sixteen and what do you have.